Pet's can be so messy when they eat and drink! Water and drool get everywhere on your floor. Make your pet's eating space more bearable with a personalized pet bowl mat! It's not just cute, but functional! 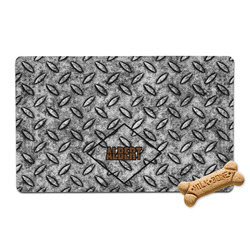 The mat is printed with your choice of design on the polyester top. The bottom is a non-slip rubber to ensure no sliding when it gets wet around your pet's bowls. This mat is sturdy, cute, and machine washable! Be sure to simply wash it with like colors. The dimensions are 16" x 10"; the perfect size for a food and water bowl. 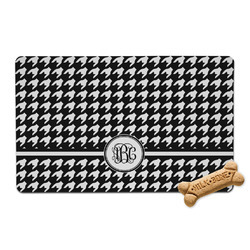 Personalize your pet's mat with a cute saying or with their name. Choose a fun animal pattern or something to match your decor. You can change and create every single part of your design from the background to the text to the graphics and ribbons! Go all out designing! If you ever need any help in our design center give us a holler. We are always happy to help fulfill your artistic dreams.